I am sitting with the HR Director of a major Australian organisation. She whispers about another round of cost-cutting created by the latest restructure and the total number of jobs that have been eliminated from the organisation. As I probe a little it is that the segment to get the hardest hit was middle managers. Her rationale is no different from the stories I hear from other HR Directors around the industry. Cut out the fat in the middle to protect customer facing roles. 75% of the reported reasons people quit their jobs are directly tied to their manager. Only 30% of U.S. employees and 13% of employees worldwide are engaged at work—and these low numbers haven’t improved in nearly 12 years. Sadly the contribution of middle managers has often been overlooked in the rush to reduce costs. Let us look through a different lens into the value of middle managers. Managers play a critical role, not just in making sure work gets done, but in really engaging employees to be more vested in the organisation and motivated to contribute their best they can. They are vital in helping organizations keep and grow top talent. Do your middle managers lack the required leadership skills? Do they have “tunnel vision” and have lost interest in the broader picture? Do they lack empathy and are unaware of their impact on others? Do their relationships with their employees, peers, or higher-ups be perceived as weak? Do they run confusing or unproductive meetings? Do they communicate in an overly technical, unclear, or uninspiring way? Do they have trouble making an impact with diverse and virtual audiences? Do their employees do the minimum to get by? Do their employees feel disconnected from the organization’s vision? The words “manager” and “leader” are often used interchangeably, but there are some distinct differences between management & leadership. The primary role of the manager is task allocation and deadline supervision. It’s all about keeping the day-to-day running and ensuring assignments and projects get completed. Leadership behaviours, on the other hand, are more relationship-based and future-focused. Leaders see both the wide and the long view, and they know how to connect to people and to the broader organizational vision. They have the skills, confidence, and credibility to inspire people to act, rather than demand compliance with their orders. 1. Reach out & find common ground to build strong relationships. Authenticity is key. When confronted with sleek businesspeople, our natural instinct is to be sceptical. Authentic leadership requires that one’s actions and words align, which in turn develops credibility and trust. The best leaders can balance their identity while still effectively managing and influencing. Help your managers consider the people, places, and events that shaped them as individuals. Encourage them to share this experience with others to help inspire them, build trust, and find common ground. Managers should ask for feedback informally from their colleagues and employees, and more formally from their own boss or HR managers. Effective leaders switch from being action-oriented to spending the time to reflect on improvement and the team. Managers should book time in their calendars to review actions and conversations, and plan future conversations and mentoring discussions with their teams. Good leaders don’t “dump” their work on people. They delegate in a way that provides an opportunity for others to add value. This approach requires managers to understand their team members’ strengths and interests and give their full attention while describing the project so the employee feels invested and personally accountable for its success. To delegate more effectively, managers need to provide employees with a better understanding of how their role fits into the bigger context. The formal performance review shouldn’t be the only time managers tell their team members why their contributions are valued. When a job is well done, your managers should acknowledge it and reward the person responsible. When there’s room for improvement, your managers need to appropriately offer feedback – this is how people grow, full stop. Managers need to remember that their team comes to work each day by choice. If you’ve done your hiring right, your employees know how to do their jobs and expect you to need them. Managers should have enough of a relationship with each person on their team that they can confidently know they’ve assigned every task to the right person. Active listening and communicating to get buy-in are more effective in the long run than orders and demands. Be present and listen. By regularly asking for feedback and really listening to the answers, managers can improve their own effectiveness as well as that of their teams, and ultimately get better overall results. This will signal to others that the manager is open to feedback and advice. This will help them be more sensitive to subtle cues and recognize opportunities to offer support and empathy. Some leaders let junior colleagues speak first in meetings, which is a great chance to empower the team to collaborate more effectively. A good leader has at least one conversation every day with a team member that is not about work. What makes a manager a leader? People are looking for opportunities to grow in their role and apply their talents, and they’re looking to their middle managers, not just for direction on tasks, but for connection, example, and guidance. The good news is that these are leadership qualities that your managers can develop with the right self-reflection, training, and support. Middle managers connect with over 80% of the people in an organisation. They are the fuel to mobilise people if they engage in the right way. Their impact on the return on investment of your total people costs is huge. So can you afford not to make the training of middle managers in leadership skills your top priority? 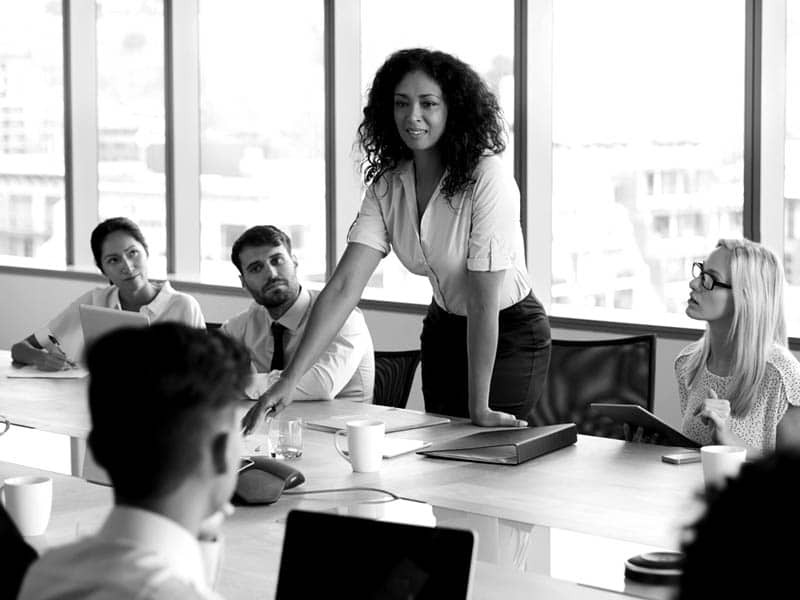 At the Ariel Group, we offer a range of leadership courses & programs focused specifically on helping managers cross the line into true leadership. Contact us today to discuss how we can help your managers evolve & develop the leadership skills they need to motivate & inspire their teams.